This post is sponsored by Mirum Shopper. Opinions are 100% my own. 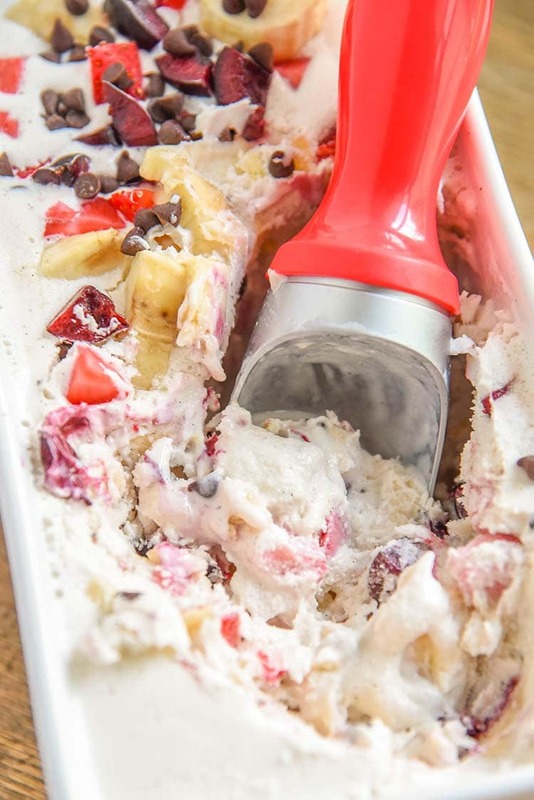 Our banana split ice cream recipe is filled with everything you would want in a homemade banana split, including the cherry on top! All the delicious flavors of a traditional banana split mixed into a rich and creamy all natural ice cream from Breyers! How are you celebrating National Ice Cream Month? By the way, National Ice Cream Day is always the 3rd Sunday in July. You get to celebrate extra that day. 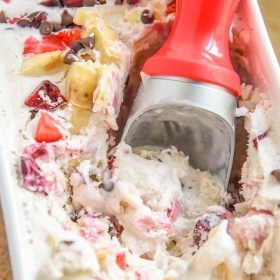 We’re celebrating with our Banana Split Ice Cream Recipe! 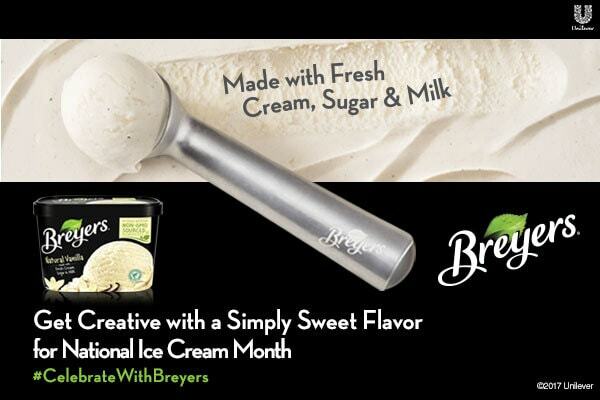 Buy Breyers with convenience at your local Walmart. Order fresh groceries online with same-day pickup, they’ll even load your car! 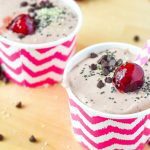 You won’t believe how easy it is to make this ice cream. 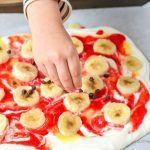 All you need are a few simple ingredients that you can find in the produce section or even the freezer section, some chocolate and whatever other toppings you like on your banana split. You can go crazy or keep it simple. One flavor we all loved as a family was Breyers Natural Vanilla Ice Cream. We would buy all the fixings to make a banana split at home. It was so much fun putting all our favorite goodies on top and then, of course, eating it! Now, this isn’t going to be a recipe you’re going to have to churn. It’s super simple and super delicious. 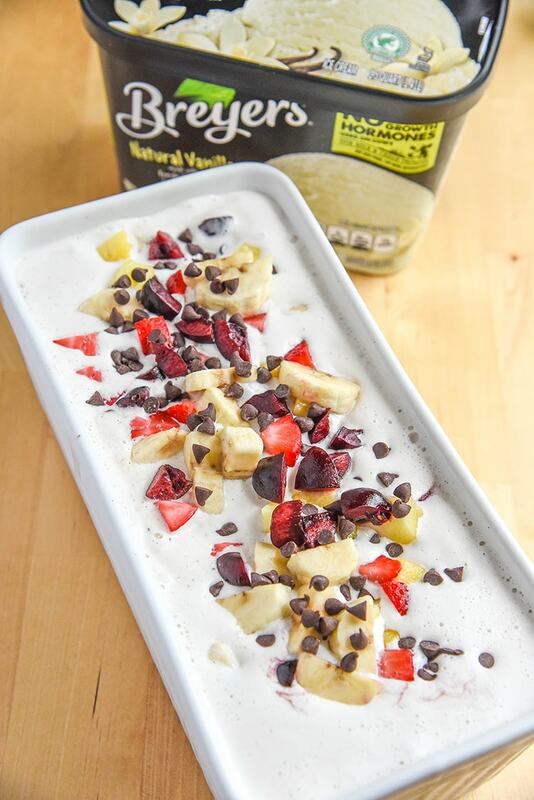 We went with fresh quality ingredients like fresh cherries, fresh strawberries, fresh bananas, frozen pineapple, and mini chocolate chips! 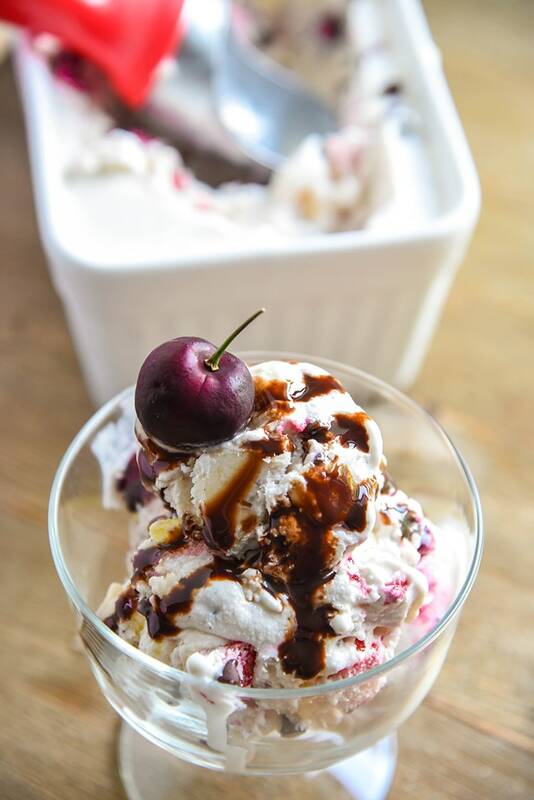 You can absolutely use the canned cherries if you’d like, but we just love the flavor of a real cherry in our ice cream. Also, if you don’t want chocolate chips you could even drizzle in some of our easy chocolate ganache recipe, chocolate fudge, or even chocolate syrup. 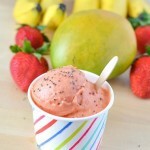 You can a bite of fresh fruit in every spoonful! 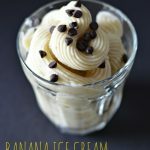 Want to make this banana split ice cream recipe for a crowd? 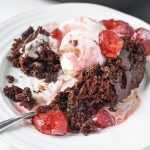 Leave out the strawberries, triple the recipe, and use one chocolate and one strawberry ice cream in addition to the vanilla. When I think of Breyers I think of high quality ingredients. It has ingredients that are easy to read and you know exactly what they are. The first few are cream, sugar, and milk! When I was approached to make a recipe using Breyers I wanted to keep the quality of my own ingredients going in high quality and natural as well. Breyers is non-GMO as well! That’s why we came up with our easy to make banana split ice cream. 🙂 You can come up with your own flavors or even enjoy it as. 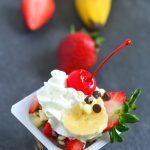 Our banana split ice cream recipe is filled with everything you would want in a homemade banana split, including the cherry on top! In a large bowl mix the Breyers Ice Cream until it's broken down instead of a huge block. 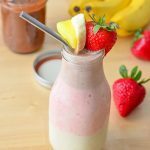 Add in the strawberries, pineapple, cherries, bananas, and chocolate chips. 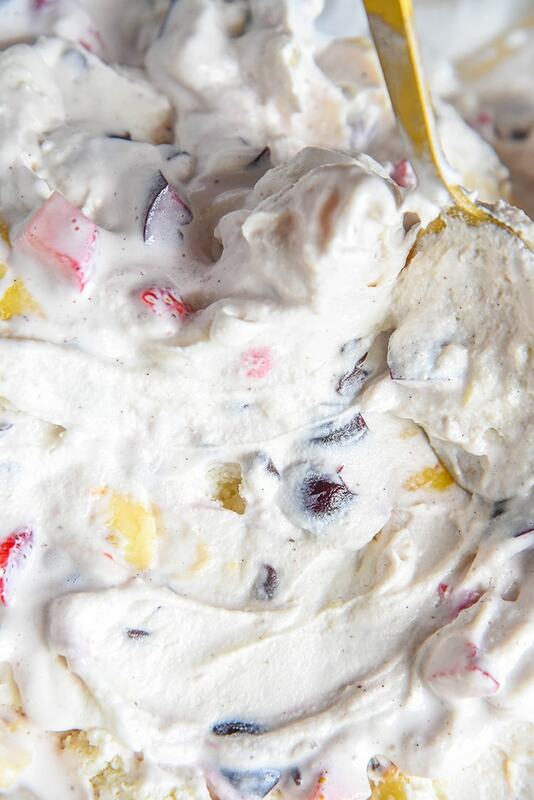 Mix the toppings and ice cream together until fully combined. Once combined, pour the ice cream mixture into a freezer safe container. Freeze for 2 hours or until it reaches desired texture. Want this ice cream done even quicker? 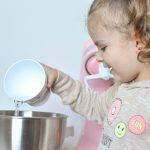 Pour the mixture into an ice cream maker and serve after it's come together.